Zapier is an online integration tool that allows you to automate actions between your HoneyBook account and hundreds of other online applications, allowing you to spend more time on the things you love doing. You can learn more about what Zapier does here, and get an overview on Zapier's terminology (Zaps, Triggers, Actions, etc.) here! Connecting your HoneyBook account with Zapier will allow you to select HoneyBook from your list of connections when you create your first Zap! 1. From your HoneyBook home page, click your profile photo in the top right corner of your screen. 3. Click the Integrations tab. 4. In the My Social Accounts section, click Show in the Zapier field. 5. Click Copy to copy the API key. 6. Now, log in to your Zapier account—or create an account, if you haven't yet! 7. Click Make a Zap to create your first Zap (and connect HoneyBook in the process). You can learn more about creating Zaps in Zapier's Help Center. 8. To begin setting up your trigger (the event that will start your Zap), first, choose HoneyBook as your Trigger app by searching HoneyBook in the search bar. A payment status changes to "paid"
10. Now, click Connect an Account to integrate your HoneyBook account. 11. 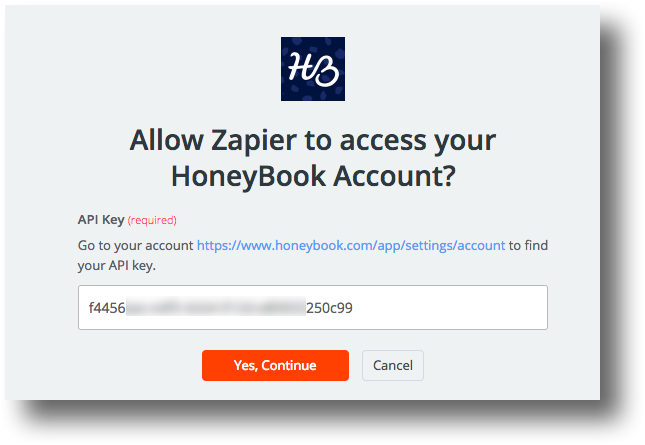 Follow the on-screen prompts to enter the Zapier API key you copied from HoneyBook. You have now connected your HoneyBook account to Zapier. You won't need to complete this step to create any additional Zaps—it will be stored for you! Zapier will now test the connection between accounts. 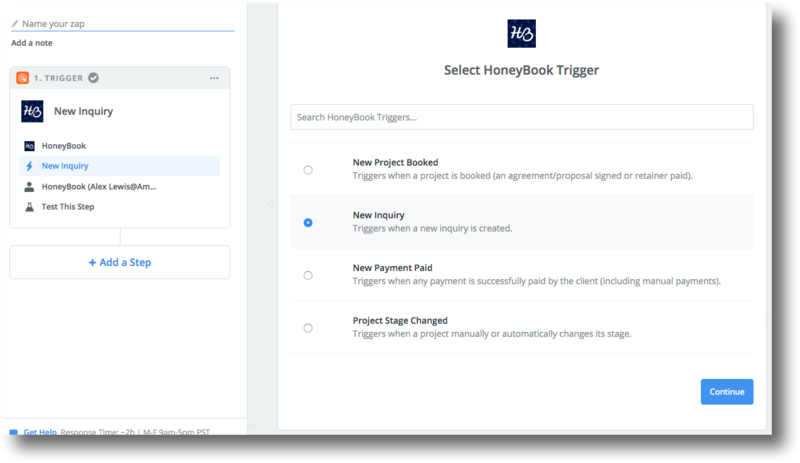 Depending on the trigger you chose, you'll need to make sure there is information to pull from (for example, if you chose to create a Zap based off a new Inquiry, you'll need to have a new Inquiry in your HoneyBook account to test). 13. After the test is complete, click Continue. 14. Finally, create your Action by selecting an Action App—where the Action itself will take place—and the Action itself. Depending on the App you choose, a variety of Actions will be available to choose from. Now, just follow the on-screen prompts to complete your selected Zap! Need Zap ideas? Check out a few here!